After the failed attempt to do this hike 2nd of January, due to lack of snow, here is a new attempt. Currently ( Protected content ) there is 50 cm snow in the valley and 90 cm at the top. With the current forecast most of that should remain until the weekend. 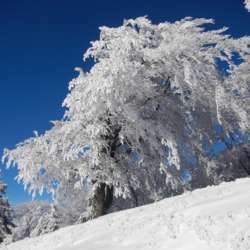 This snowshoe hike will gently take us from the small village of Libingen up to Chrüzegg. Here we'll have a nice view over the Züri Oberland to the north west and Toggenburg and Alpstein to the east. POTENTIALLY the restaurant is open and we can have a coffee (it's not clear from the website). We'll descent to the small ski resort Atzmännig. Here we can (also) enjoy a drink and snack before we head back home. This is an intermediately difficult snow shoe hike. If you are not experienced on snow shoes, you should assume double the effort of regular hiking this distance and elevation gain. If you are not experienced in judging hiking based on distance and elevation gain, contact me directly and discuss what you are used to in other sports. If you are not used to sports, this is most likely not suitable for you. Who knows... I'll update later, make sure to check here 24h in advance. If the conditions are too bad, I may cancel this event, or come up with a better/safer/dryer alternative. Snowshoes should be rented IN ADVANCE, there is no rental option at the start (a tiny sleepy village I assume). A good option is the Transa store at Europaallee, they rent out good stuff. It costs CHF20 and you can pick them up the day before the hike and return the day after. You should reserve them via telephone a.s.a.p. and can pick them up from the Service Desk. There may be other options you can explore off course, but make sure you rent grippy snow shoes that also work on icy patches. Hiking involves certain risks, by taking part in this event you acknowledge that these risks exist and are on your own account. This is a meeting of fellow hikers, not a guided tour.